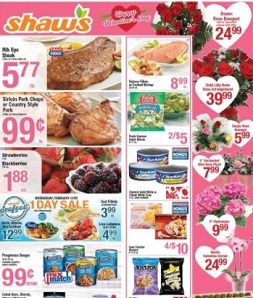 Latest savings from Shaws valid 2/9 – 2/15/2018: $5.77 lb Rib Eye Steak; $.99 lb Sirloin Pork Chops or Country Style Pork; $1.88 Strawberries 1 lb. Blackberries 5.6 oz. ; $8.99 Salmon Fillets or Cooked Shrimp 26/30 ct.; 2/$5 Fresh Express Salad Blends; 10/$10 Starkist Solid White or Chunk White Tuna; $39.99 Debi Lilly Rose Vase Arrangement; $24.99 Dozen Rose Bouquet; $7.99 4” Enchanted Mini Rose Plant; $5.99 Single Rose Bouquet; $24.99 Bonita Valentine Orchid; $9.99 Russell Stover Assorted Chocolates; $8.99 Russell Stover Hearts; B1G1 free Gorton’s Fish or Grown In Idaho Potatoes; 2/$5 Tropicana Orange Juice; $2.99 Ben & Jerry’s Ice Cream 16 oz. Breyers Ice Cream 48 oz. ; $6.99 Blue Diamond Almonds; $3.99 Frigo CheeseHeads String Cheese; $2.99 Nutella Spread; 2/$6 Lay’s Kettle Cooked Potato Chips; 10/$10 Libby’s Canned Vegetables; 3/$4 Yoplait Oui French Style Yogurt; and more.